First a disclaimer. If you are squeamish about seeing footage of nature at its most raw, than the below photos and story may not be for you. However, this is reality. Animals need to hunt to survive and some animals have to die so that others can live. With that out of the way, below is one of the rarest wildlife moments I have ever seen and captured in photographs. It is an age old battle between predator and prey. 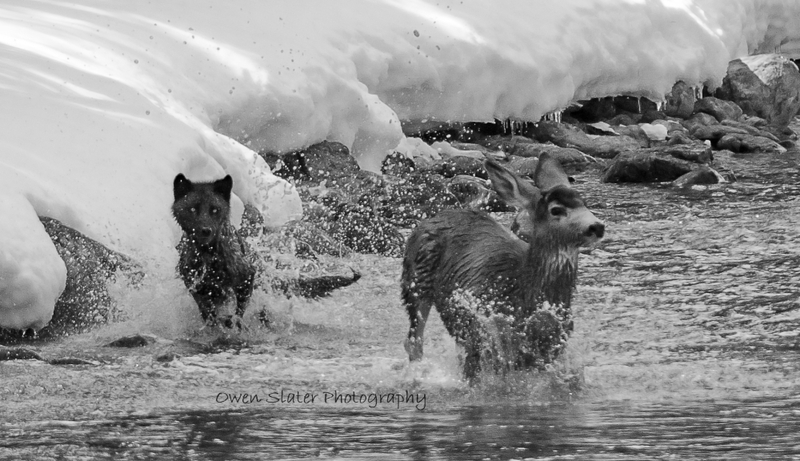 A young wolf honing its hunting skills against a seasoned mule deer. With each photo, if you would like a closer view please click on it. 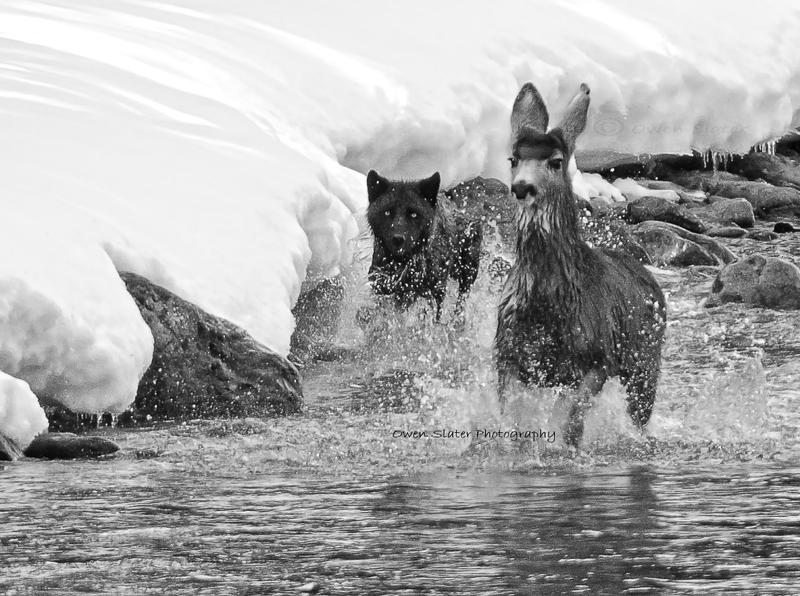 As the wolf made it close to shore, the deer who didn’t want to leave the relative security of the river and was resting along the banks, turned and they eyed each other up for a few seconds… The pause in action didn’t last long, as the wolf jumped up onto the snow bank and came directly towards the deer. Relatively calmly, the deer turn and jump back into the river and again the wolf followed in close pursuit. By the time the deer reached the other side it had increased the distance between them and I thought it would easily escape. That seemed to be certain when the deer trotted out of the river and started heading for the forest. But then something strange happened. Just as it got to the trees it stopped in its tracks. 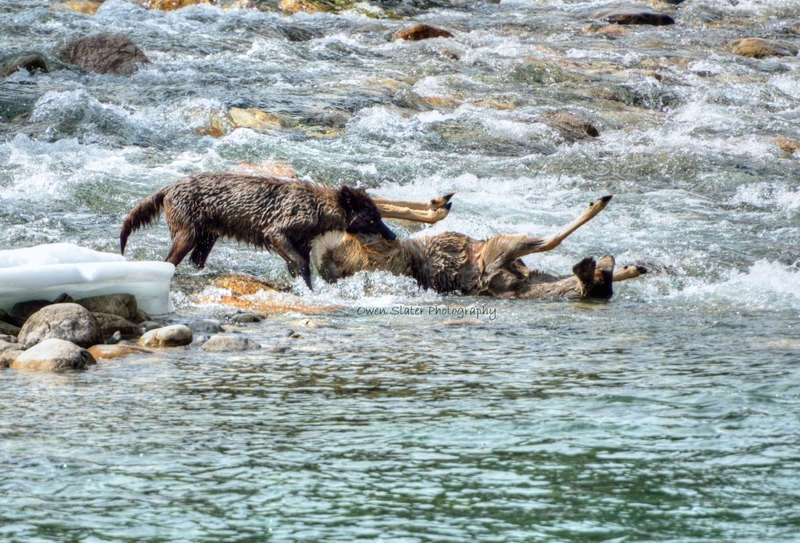 Whether it sensed other wolves waiting for it in the trees I’m not sure, but for whatever reason it quickly spun around and headed back to the river just as the doggy paddling wolf was getting close to shore. The deer seemed to have made a critical mistake by turning back to the river. As it jumped into the shallows, a split second later the wolf made it to shore. 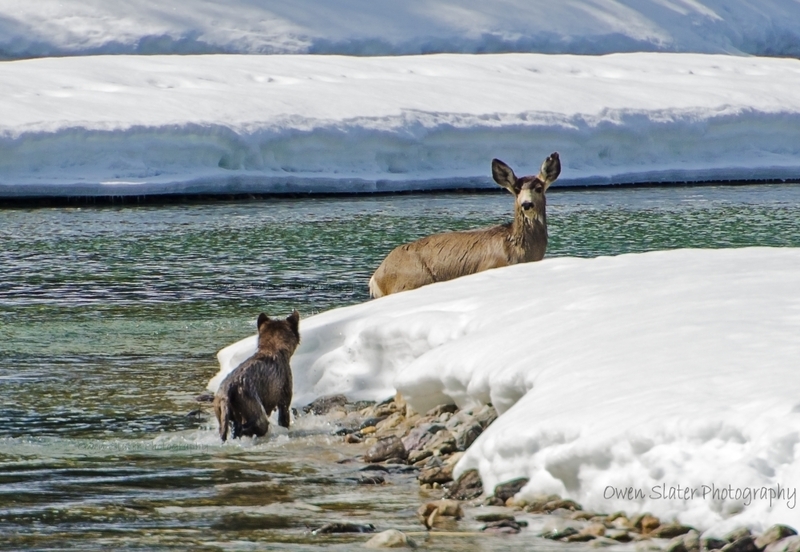 With a burst of speed and water splashing everywhere, it sprinted along the rocky banks and quickly closed in on its prey… With only a few feet separating them, the deer made one last ditched effort to escape by frantically plunging back into the river. The stamina of both of these animals was incredible. It seemed like they had reserves of energy and any time one needed a surge of adrenaline they got it. It was spectacular to watch this back and forth battle play out in front of me… Survival in the wild is always a precarious balance. One misstep by the deer on a slippery rock was all that the wolf needed to gain the advantage. With one powerful bite, it leveraged the deer off its feet and the chase was over. For most animals life is a daily struggle with little in the way of certainties. Wolves only have about a 10% success rate during hunts and so the majority of their prey get away to live another day. This particular wolf was just coming into its prime and its possible that the mule deer was an old male that was too weak from winter and the fall rut to outpace the wolf. Whatever the reason, nature took its course. To have wild places in North America where animals can still play out their age old battles and we are the outsiders that only get rare glimpses into their world is something I hope we can maintain well into the future.